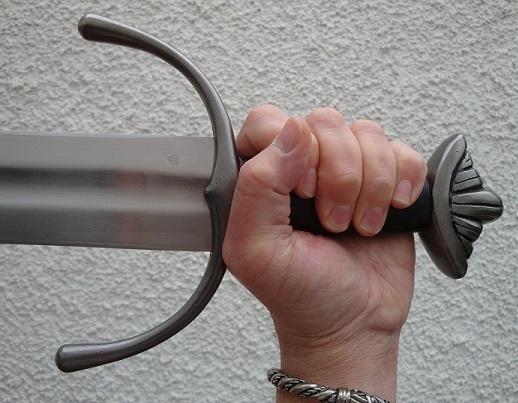 The Del Tin Late Period Viking Sword is an excellent example of an early medieval Oakeshott Type XII sword - the most common type of medieval arming sword by blade shape - but still with a distinct Nordic appearance in the fittings. 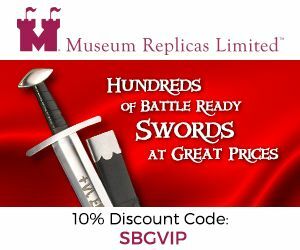 Based on a real sword commonly known as the 'Cawood' it has been replicated with varying degrees of success by many sword companies - below you can see the Del Tin Late Period Viking Sword in the middle of two other manufacturers replicas of this same sword. So how does it stack up against the competition? Read on and find out first hand. Blade Width Base: 2 3/8"
Type XII: Oakeshott characterized the Type XII as "having a broad, flat, evenly tapering blade, generally with a good sharp point and tending to widen perceptibly below the hilt." The fuller will be well defined, generally extending from below the guard for two-thirds to three-quarters of the blade's length. Examples with double or triple fullers have been encountered. The blade's cross-section will be of lenticular design and the blade will typically be from thirty to thirty-two inches long. The grip will be a bit longer than previous types, usually measuring around four and a half inches. The style of guard is not a defining feature of the type, with almost any style being possible. 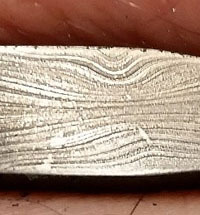 However, a short, straight guard is the most common, often with a round or octagonal cross-section. 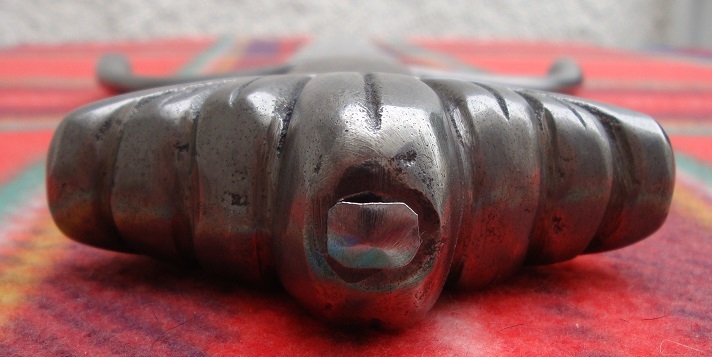 The pommel can also be of nearly any type, but is most commonly a thick disc with strongly beveled edges. Original: The original which Del Tin based their version was found in the River Ouse south of York, England, and is dated circa 1100. 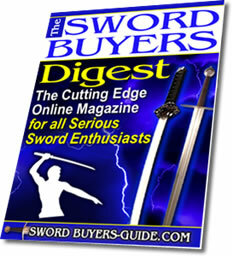 There is also another sword which Oakeshott thinks was made at the same place found in Korsoygaden, Norway. 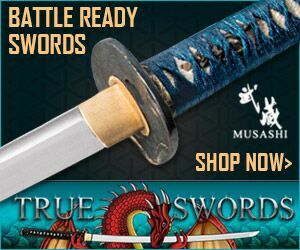 Both swords are very similar. 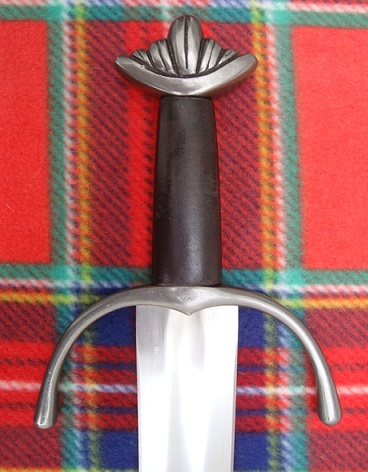 The original's pommel seems to have been silver plated and the blade had inscriptions which were not added to the Del Tin version. The cross on the original has one arm lightly bent and is not symmetrical. 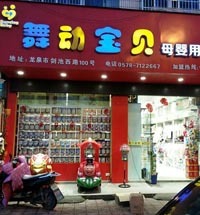 It is believed it was made that way and not a result of use. Del Tin made the copy with a symmetrical guard. 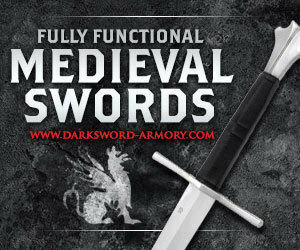 Impressions: Del Tin has two versions of this sword for sale. One has a 34" blade. This version has a shorter blade and weights in under 3lbs. 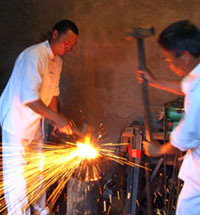 The fittings are mild steel using the investment casting process. This sword is actually pretty decent and handles quite well. It has that rustic look Del Tin imparts on their fittings and grips. 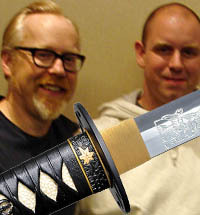 I am pleased with the visual look of this sword. 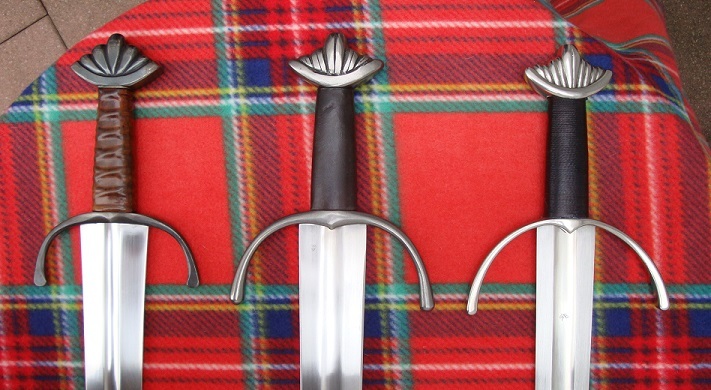 During the period when much of the British Isles were under Norse control and cultural influence, many weapons later found are of Scandinavian design. Many were from the Viking Age but some weapons found are clearly from the medieval period but retain Nordic characteristics from the interaction and settlement of the Norse from the past. 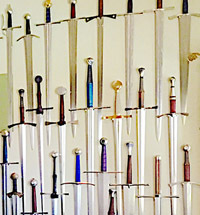 My understanding of the term "Transitional Viking" is derived from swords found in the late Viking/early medieval period that had hilts of Norse style paired with more modern blade types. Pros: The Del Tin shorter bade version is a nice sword for the price. 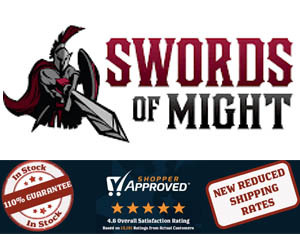 I did not buy this sword for a long time as the review on MA did not give me a warm fuzzy. After checking KOA stats against the reviewed example on MA, I saw enough of a difference to entice me to buy it. 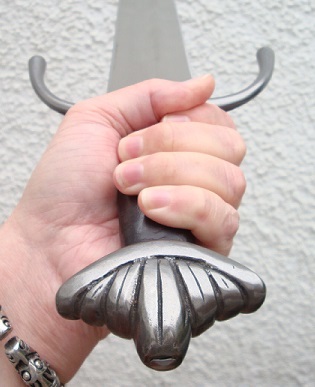 The sword I have does not mirror the MA reviewed example in regards to weight and POB. Maybe Del Tin made changes to this model? Cons: Some people may not like the rustic Del Tin fittings. More expensive than the Hanwei version. 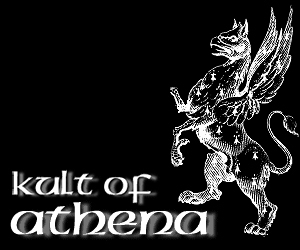 William picked up his Del Tin Late Period Viking Sword here at Kult of Athena for $424.95 which for North American customers is easily the best choice for buying Del Tin Swords as they often order in stock and there is no excessing import fees as KoA import them in bulk.